Little did Rosa Parks know that her act of civil disobedience 55 years ago would help end segregation laws in the South. 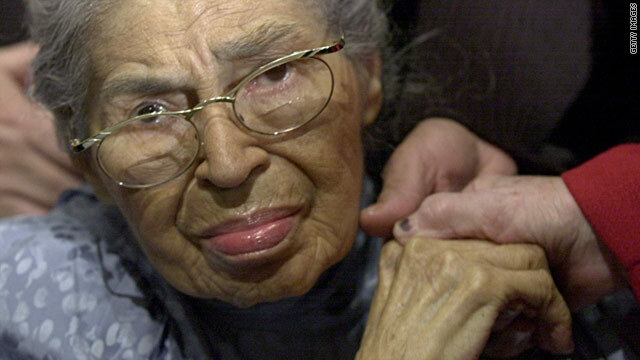 (CNN) -- An act of civil disobedience 55 years ago -- Rosa Parks' refusal to move to the back of a city bus -- made the seamstress in Montgomery, Alabama, a pivotal symbol in America's civil rights movement. Wednesday marks the 55th anniversary of the civil disobedience on December 1, 1955. Parks did not intend to get arrested as she made her way home from work that day. Little did the 42-year-old seamstress know that her acts would help end segregation laws in the South. The events triggered a 381-day boycott of the bus system by blacks that was organized by a 26-year-old Baptist minister, the Rev. Martin Luther King Jr. Parks, who died five years ago in Detroit, Michigan, at 92, still has the power to inspire. "I think that she, as the mother of the new civil rights movement, has left an impact not just on the nation, but on the world," U.S. Rep. John Conyers, a Michigan Democrat, said shortly after her death. "She was a real apostle of the nonviolence movement." Facing regular threats and having lost her department store job because of her activism, Parks left Alabama for Detroit in 1957, where she later joined Conyers' staff. Parks later co-founded the Rosa and Raymond Parks Institute for Self Development to help young people pursue educational opportunities, get them registered to vote and work toward racial peace. Parks remained active on the lecture circuit into her 80s, speaking at civil rights groups and accepting awards, including the Presidential Medal of Freedom in 1996 and the Congressional Gold Medal in 1999.